An elderly Japanese woman was hospitalized after a snow sculpture of ridiculously-popular, virtual pop star Hatsune Miku fell on her. The (aheh) 'meltdown' took place at the annual Sapporo Snow Festival, which lasts for seven days and features hundreds of snow and ice sculptures. The statue of Hatsune Miku, virtual pop star and Vocaloid mascot, was around three meters tall - it's now somewhat shorter given that its head fell off and injured a 60-year-old woman. For the uninitiated: Vocaloid is a singing synthesizer program which aspiring musicians can use to make horrifying approximations of actual music. While my inner music snob sneers at the idea of replacing human vocalists with unfeeling automatons, though the process has worked before, some of the songs produced with the program are really quite catchy. Hatsune Miku was originally one of the voice packs available for the program - think Microsoft Sam with pigtails - but has since gone on to garner a massive following as a virtual pop star, unsettling anyone who's seen Macross Plus. 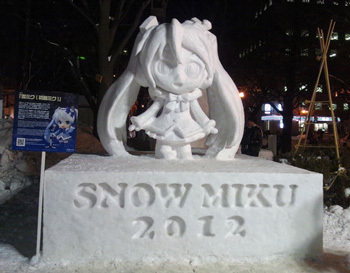 'Snow Miku' has been a regular fixture of the snow festival for a couple of years now. Organizers Sapporo festival have apologized for the incident and are currently rebuilding the statue. Miku will return to delight fans and potentially cripple elderly ladies on February 11th.